We keep about 20 to 25 sheep on the property - the number varies from year to year. 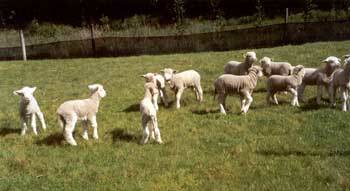 They act as automatic four legged lawn mowers and provide entertainment in the spring by producing a new crop of lambs. They also provide a yearly clip of wool for sale by auction. We have chosen to keep Merino sheep - they are the ones where the rams have huge curling horns - the animals you see in the wool carpet ads (although wool carpets actually don't have much Merino wool in them - it is much too fine and valuable). 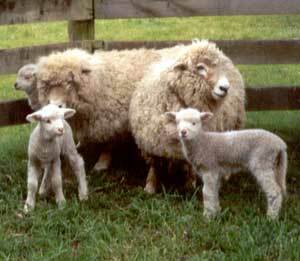 Merinos are tough sheep, and are probably the most common breed in outback Australia. They do not grow big and fat and thus are not kept for meat production. Their strong point is that they produce the finest high quality wool. We shear our sheep in the spring after they have lambed. Generally we get together with another small holding owner down the road so that together we have 70 or so sheep so that it is worthwhile for a professional shearer to spend most of a day shearing. We transport the sheep down the road to yet another nearby property where there is a proper shearing shed complete with shearing machines and a happy day is had by all while the sheep lose their winter coats. The sheep love losing their heavy wool coats and have a tendency to leap into the air as they are let out of the shearing shed. There are a number of less than desireable things associated with keeping sheep - as is common with most animals (including ourselves) I suppose. Sheep have heavy wool fleeces and suffer from a number of rather disgusting health problems. Prime amongst these is fly strike caused by a blow fly (imported from Australia) which loves to lay its eggs on smelly sheep's backsides - sheep are quite stiff and cannot reach their own back ends. If they are left, the maggots will kill the sheep in only a few days - not a nice way to go. So during the summer one has to always be alert for signs of flystrike. Another less than desirable ailment is lice infestation. Our sheep have had lice from when they first arrived on the property. The lice only make their presence obvious during late autumn/winter when the sheep's fleece gets long and thick. 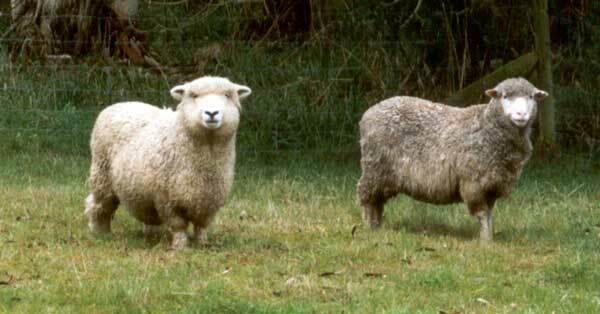 They cause intense itching and the sheep rub on posts and trees and in bad cases can rub their fleece right off. Year after year we have tried to eradicate the lice - they can only be treated just after shearing and you cannot tell whether you have been successful until next autumn when you cannot treat them. This year we tried a new insect growth regulator treatment - hopefully we have finally been successful - we will soon know - it is autumn now and no signs of lice yet.